From 1981: STAR WARS THE EMPIRE STRIKES BACK MONTHLY, from MARVEL UK, issue 145. I'm sure I wasn't the only old-skool STARLOGGER to experience a tinge of recognition as soon as the title of the next instalment of the STAR WARS screen saga was announced. We've been there before. Around this time back in 1981 to be more accurate. If you lived on both sides of the Atlantic. 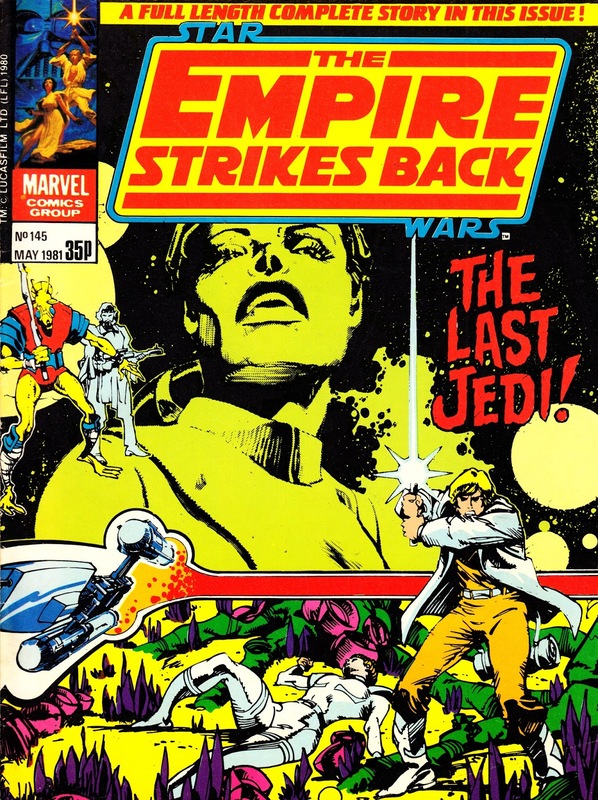 Marvel's seat-of-the-pants transatlantic publishing schedule meant US issue 49 (cover-dated July 1981 but on-sale in late April) and UK issue 145 (cover-dated May but on sale sometime in the previous month) both hit at about the same time. Long gone was the luxury of having months as a buffer between the two editions. The UK edition wisely dispenses with the pink colour scheme of the original cover for a can't-go-wrong green design. The interiors were - of course - all in black & white. I think we can be pretty confident that the new movie will be similar in-name-alone to this issue. But it is still a good bit of fun to know that Marvel got there first. Proof that Marvel have always been way ahead of the pack. The final image of Luke in space, raising his lightsaber is one not easily forgotten. in fact, Rey is striking a similar pose in THE LAST JEDI poster.